On April 25th the USC School of Cinematic Art dedicated the John C. Hench Endowed Chair, making it the 31st endowed chair at the School. The Chair was endowed by the John C. Hench Foundation, which previously named the School’s John C. Hench Division of Animation & Digital Arts, in 2006. 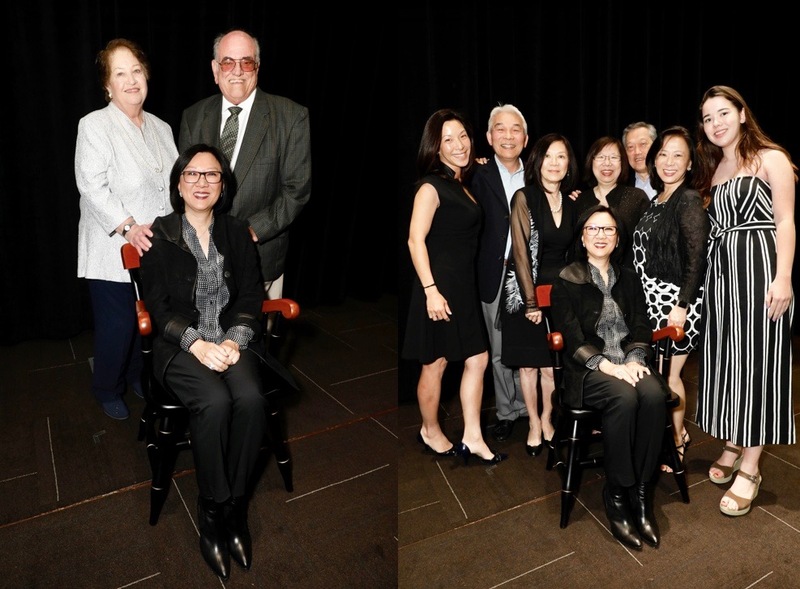 Foundation trustees Jose and Leonor Deetjen were joined by Dean Elizabeth Daley (above right), USC Provost Dr. Michael Quick, and alum Andrew Millstein (above left) in honoring Teresa Cheng (above center) as the first holder of the chair. Teresa Cheng has been the head of the Animation division since last year, overseeing a vast curriculum that covers everything from 2D hand-drawn work to stop motion to visual effects. In a fast-paced and future-focused field, animation students are constantly collaborating with their peers in other divisions and learning from the work of legends who came before them. 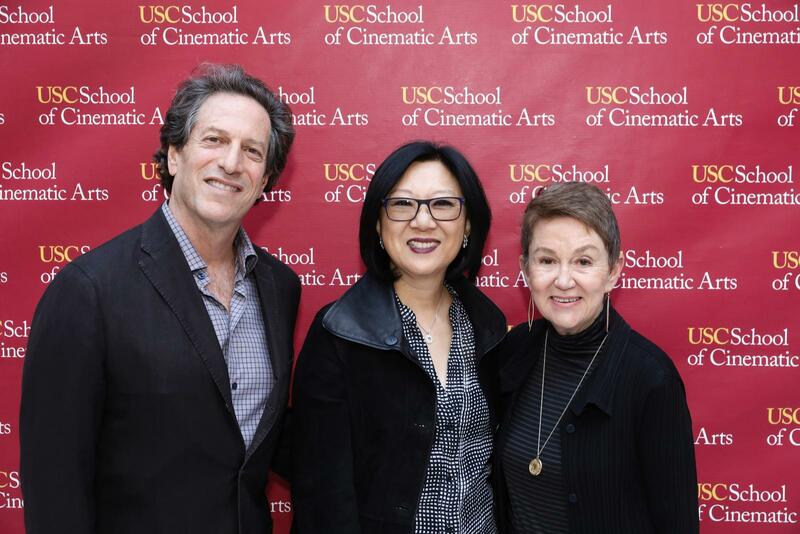 SCA Dean Elizabeth Daley said the foundation’s continued generous support will ensure that the next generation of animators will have the best resources and opportunities at USC to finetune their craft and begin successful careers. John C. Hench was an animation legend who always seemed to be one-step ahead of his time, Dean Daley told the audience gathered in the Ray Stark auditorium for the dedication. She also highlighted Hench’s immeasurable contribution to the Disney Corporation. “Any celebration of John Hench’s legacy is essentially a celebration of Disney Animation,” she said. “John was Walt Disney’s right-hand-man and spent more than 65 years at the Disney Corporation, contributing to every aspect of its success.” The original Disney Imagineer, Hench worked on iconic films such as Fantasiaand Alice in Wonderland, and also found time to spend afternoons drawing with students at USC. Hench served as an extraordinary example of what it means to be a creative pioneer, and the John C. Hench Foundation continues to promote his tradition of mentorship. 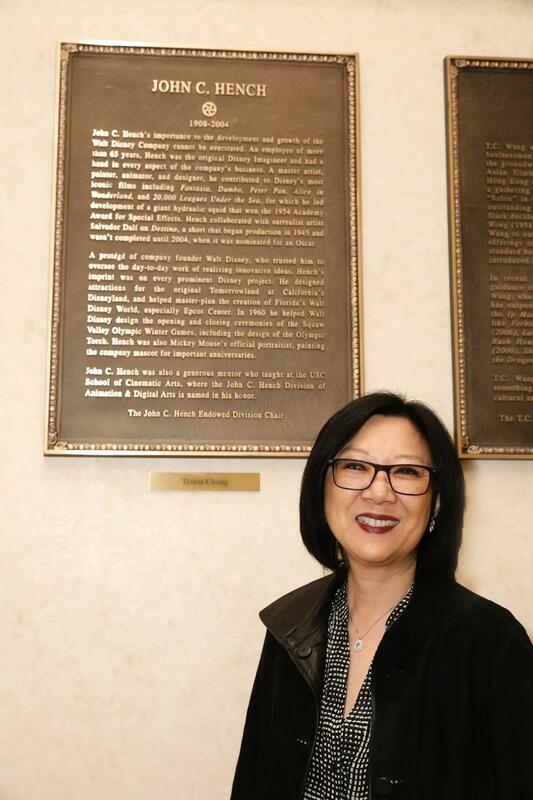 Throughout the evening Teresa Cheng was hailed as the perfect person to cultivate a culture of teamwork and critical thinking for students in the Hench Division. Above left: Leonor and Jose Deetjen with Teresa Cheng. Above right: Teresa Cheng with her family.